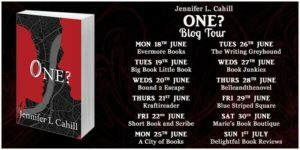 Welcome to my stop on the blog tour for One by Jennifer L. Cahill. This book sounds great and I wish I could have fitted in a read of it. Instead, Jennifer is going to tell us who her top five authors are. My thanks to Faye Rogers for the place on the tour. 1. Gabriel Garcia Marquez – I love all of his work, and his characters really stayed with me. Love in the Time of Cholera is one of my favourites, as is 100 Years of Solitude. He really draws you into his imaginary world and makes you very reluctant to leave when the books end. 2. Isabel Allende – I love her work. It’s even more fascinating when you take the political backdrop of the time into account and how she, and the other writers circumnavigated the censorship of the time through literature. 3. Margaret Atwood – I’m addicted to the Handmaid’s Tale, it is absolutely genius. It’s so complex. 4. Audrey Niffenegger – The Time Traveler’s Wife is one of my favourite books. The ending was stupendous. 5. Daphne du Maurier – Rebecca is a classic favourite of mine. 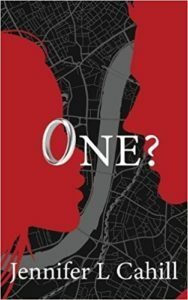 Beautifully written, and I completely fell in love with Manderley. 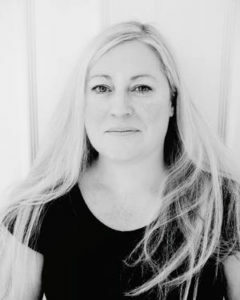 Living in Notting Hill, Jennifer L Cahill works with both individuals and blue chip clients to help them navigate and master change and transformation. She has over seventeen years’ experience in consulting specialising in change, communications, business transformation and personal development. She has a graduate degree in International Commerce and Spanish and a Masters in Business Studies. In her spare time she loves embracing her more creative side.